Teacher's Take-Out: Vocabulary Words Journal -Freebie! 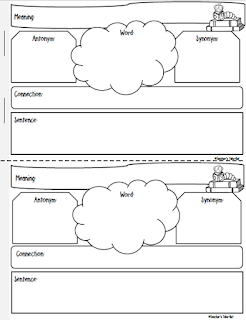 • Assemble 10 to 20 pages of the Vocabulary Words Web Sheet, back to back, for each student. Staple pages together to create a Journal. Journals can be ½ sheet size or full size with 2 webs (or 2 vocabulary words) on 1 page. • Students write the vocabulary word in the cloud located in the middle of the web. They write the meaning of the word, antonym, synonym, a connection they have with the word, and translate the word into a sentence to demonstrate understanding.